A Captain America: Steve Rogers #1 Review – Hail Hydra?!? This is the one everybody’s talking about. 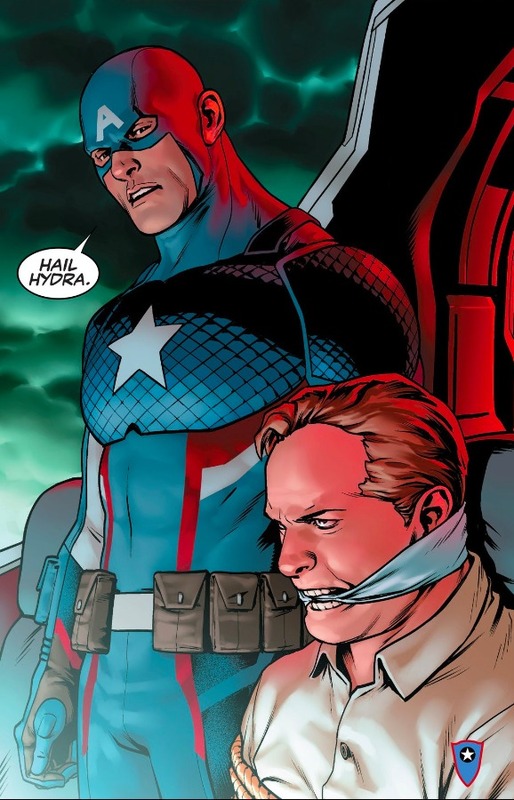 The one where Cap says “Hail Hydra.” You already know about it. Every fan with internet access knows about it. So why dance around it? Steve Rogers has had his youth restored and is Captain America once again. He and Sam Wilson now share the title, with Rogers getting a new suit and shield. He’s also got new partners. In addition to Sharon Carter and the crew at S.H.I.E.L.D., Rick Flag and Free Spirit are back in the picture, with Rick Jones backing them up from home base. Our team faces off with a new incarnation of Hydra, and them comes face-to-face with Baron Zemo. This issue establishes our cast, shows us who the bad guys are, and gets the plot moving. All in all, it’s a pretty standard issue. Until it isn’t. That’s a sentiment shared by many a reader. Nick Spencer apparently received death threats last week. Apparently some fans are burning copies of the issue. Firstly, remember what we’re reading. It’s a mainstream superhero comic book. Owned by Disney, no less. This Hydra thing is a stunt. In a year or two at most, this all will have blown over. Anybody freaking out THAT much about a comic book, or any seriously needs to find other things to do with their time. What’s more, things may not be what they seem. 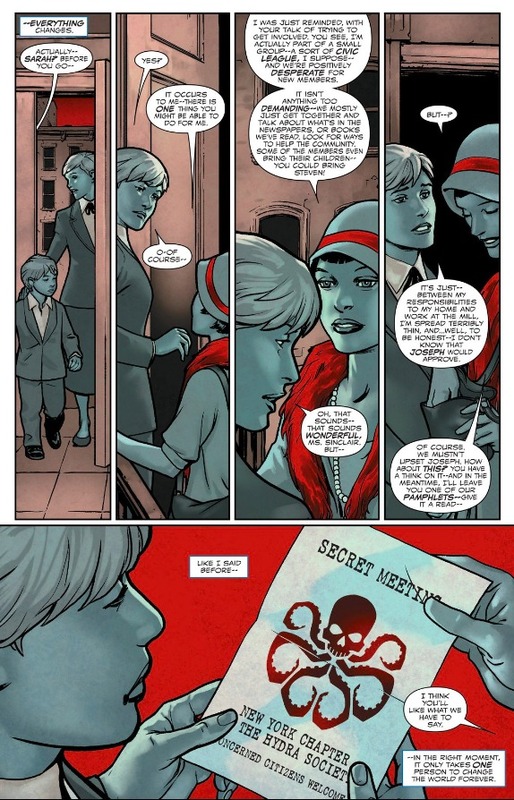 The issue shows us that in 1926, Steve’s mother was befriended by a Hydra agent. At the time he’s a little boy. The implication is that Hydra got to him before he was old enough to know what was happening. It’s not as if he willingly turned his back on his country. What’s more, this is only the first chapter. For all we know, Steve knew Flag would be saved somehow, and the Hydra line was part of a ruse of sorts. But of course, the only way to find out is to come back for issue #2. There’s your real motive right there. Spencer’s take on Hydra is very compelling. They’re bad guys, obviously. But via a flashback scene with Red Skull, Spencer makes it very plausible that someone from a certain background or facing economic hardships could fall in with this crew. Rarely has Hydra been so…relatable. Jesus Saiz handles the pencils, inks, and colors all himself here. His best work in the issue are the flashback scenes with Steve, his mother, and the mysterious but kind stranger who invites her into Hydra. Her facial expressions are done particularly well during the first half of the issue, and her 1920s flapper style makes her stand out. The cool blues and deep reds add a nice dramatic flair to things. I have a question: How old is Sharon Carter supposed to be? I get what they’re going for, with Steve being young again while Sharon continues to age. But Saiz’s depiction of an older Sharon looks, shall we say, unnatural. He seems to be going for someone akin to Michelle Pfieffer or Sharon Stone. But he’s trying too hard, and winds up landing closer to Willem Dafoe. That’s particularly uncomfortable mid-issue when Sharon kisses Steve. Nick Spencer finds himself in a unique position here. We’ve got two Captain America books on the stands right now, each starring a different hero, and he’s writing both of them. 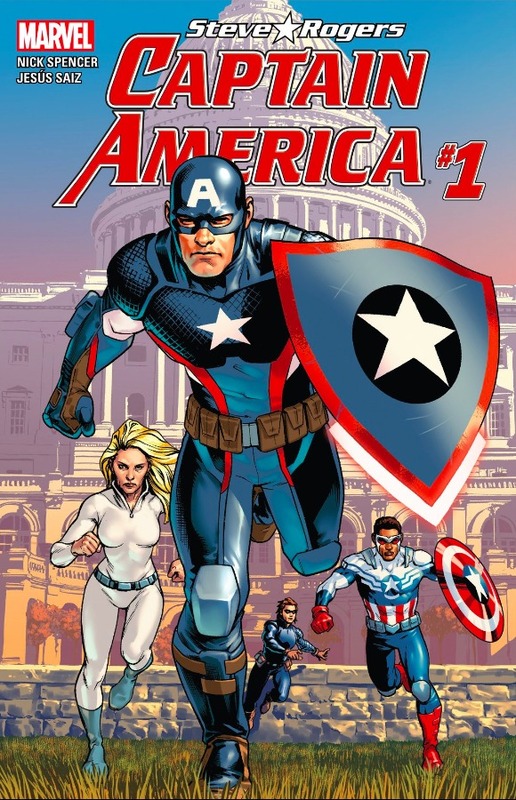 So in approaching Steve Rogers, he obviously needed to find a way to clearly differentiate it from the Sam Wilson book. Whether you like the Hydra route or you hate it, you’ve got to admit he succeeded in that sense. He also got people talking about Captain America, and thinking about what the character really stands for. While this issue may be pretty standard up until the big reveal, it still does what very few issues have done over the course of Cap’s run. That makes it a winner, like it or not. This entry was posted in Comic Books/Graphic Novels and tagged Baron Zemo, Captain America, Captain America Hail Hydra, Captain America Hydra, comic book reviews, comic books, Free Spirit (Marvel), Hydra, Jesus Saiz, Jim Ross, Marvel, Marvel Comics, Nick Spencer, Red Skull, Rick Flag, Rick Jones (Marvel), Sharon Carter, single issue reviews, Steve Rogers, Steve Rogers: Captain America #1 (2016), superhero comics, superheroes on 05/30/2016 by primaryignition.